ROCHESTER, NY--(Marketwired - December 07, 2016) - With the end of 2016 fast approaching, now's the time for small business owners to take steps to potentially lower the taxes they owe this year and make sure they're prepared for new tax issues that will roll out in the coming months. 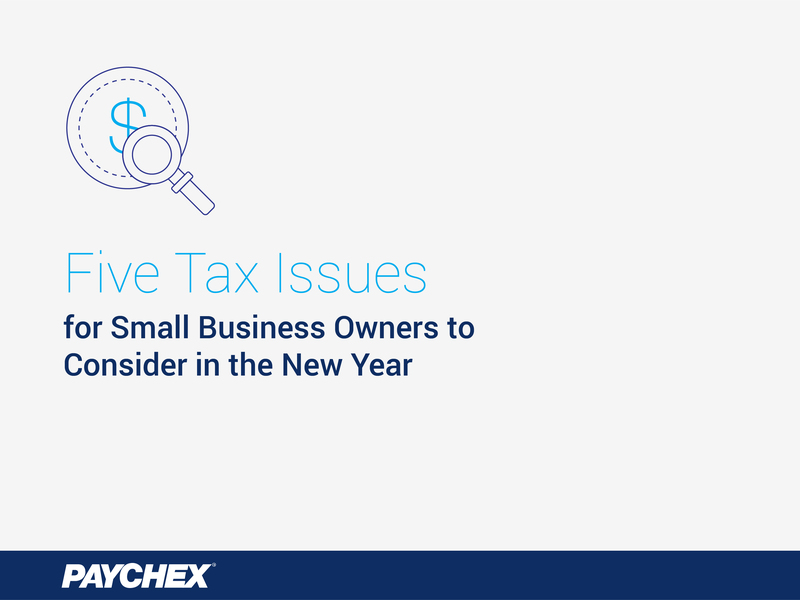 Paychex, Inc., a leading provider of payroll, human resource, insurance, and benefits outsourcing solutions for small- to mid-sized businesses, today released its list of tax regulations for small business owners to carefully consider as they approach the New Year. 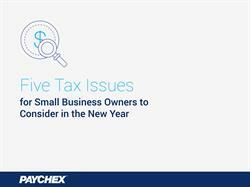 "As rules, requirements, and deadlines shift, even the most well-informed small business owner can get lost in the ever-changing world of taxes and other regulatory issues," said Martin Mucci, president and CEO of Paychex. "During this season of small business, we're focused on providing small businesses with information that can help them achieve a strong close to the year and prepare for an even stronger 2017." Affordable Care Act. For tax year 2016, business owners who are defined as an applicable large employer (ALE), under the Employer Shared Responsibility Provision (ESR) of the Affordable Care Act (ACA), must include a detailed reporting of healthcare coverage. However, the due date for furnishing the 1095-C has been extended from January 31, 2017 to March 2, 2017. The deadline for filing the forms with the IRS remains March 31, 2017 for electronic submissions. Also, reporting entities that can show they made a good faith effort to comply with the reporting requirements -- both for furnishing statements to individuals and filing statements and returns with the IRS -- may be eligible for good faith transition relief from section 6721 and 6722 penalties to the 2016 information reporting requirements under sections 6055 and 6056. Accelerated W-2 Form Filing. There is a new federal law that accelerates the W-2 filing deadline for employers to January 31, 2017. Be sure to pay close attention to the W-2 filing deadline in your state as many states across the U.S. have also accelerated the filing of W-2 information to January 31, 2017. Accelerating the W-2 filing at both the federal and state levels will make it easier to detect and prevent refund fraud. Accelerated Depreciation. Don't forget that the Section 179 deduction is still set at a limit of $500,000 as a result of the PATH Act that was signed into law on December 18, 2015. As long as equipment and software are financed and in place by midnight on December 31, 2016, they are eligible to receive the Section 179 deduction. Also, bonus depreciation is extended through tax year 2019, so small businesses will be able to depreciate 50 percent of the cost of equipment acquired and put into service during 2016 and 2017. 401(k) Tax Credit. Small businesses that start a new 401(k) plan between now and December 31, 2016 can claim a federal tax credit for the first three years of the plan to offset plan startup costs. Eligible startup costs include those necessary to set up and administer the plan, as well as those to educate employees about the plan. A percentage of contributions made by the employer are also tax deductible. Deferral of Income. Consider if deferring income into 2017 makes sense for your small business. Doing so may allow you to take advantage of reductions in tax rates the next administration is looking to enact. To download a Slideshare of the tax considerations for small business owners, click here. For other helpful tips to advance the long-term success of small businesses, visit www.paychex.com/worx/. Note: The information contained within is not tax or legal advice. These issues are complex and applicability depends on individual circumstances. Businesses should consult tax or legal counsel before taking action on any of the items identified above. With the end of 2016 fast approaching, now's the time for small business owners to take steps to potentially lower the taxes they owe this year and make sure they're prepared for new tax issues that will roll out in the coming months.